The Student Organization for Social Work (SOSW) selected Perry County Nursing Home (PCNH) as the recipient of its annual Christmas service project. Each year, PCNH social worker Jasmine Murphy sends a list of needed items to the Perry County community on behalf of nursing home residents who may not have family or whose families may struggle to provide clothes, toiletries, and treats to their loved ones. So often at Christmas, we remember to make the season special for children, but all of us, young and old, love to be remembered during the holidays. SOSW sought to make the holidays bright for our elders by hosting a drive to collect clothing, treats, toiletries, and other needed items from the entire Judson community to donate to PCNH. It should be noted that Murphy serves as a Field Instructor for the Judson Social Work program and has supervised several Judson social work students in their field experience, preparing them well for future social work practice. The Social Work Department is so grateful for Ms. Murphy’s work with us. 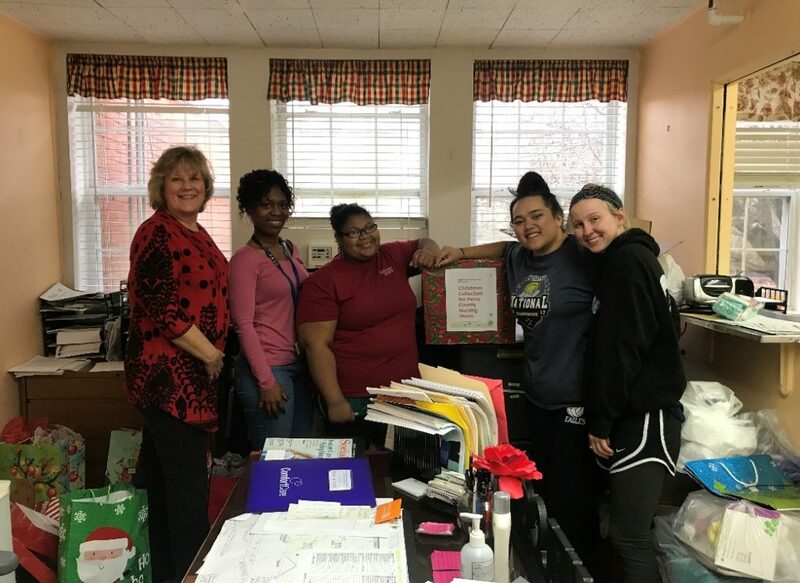 PHOTO: Social work students and faculty make the SOSW delivery to Ms. Murphy: (left to right) Angela Dennison, Social Work Department Head; Jasmine Murphy, MSW; Audri Thicklin, Junior Social Work major; Joyce Lavata’I, Junior Social Work major; Carson Beatty, Freshman Social Work major.